Some people go to college right after high school, and some take a different path. Christina Ward is an Army wife and loving mother of two. As an army wife, and mother of two she quickly adjusted to being a devoted and supportive wife and mother while learning to navigate the ups and downs of military life. Moving became a frequent part of their life, and she found that starting the life of her dreams seemed like an impossibility. Though she had everything she wanted as a wife and a mother, she struggled with a quiet desire to pursue personal goals, and expand her horizons professionally. Christina and her family moved to WV in January 2016. With her children rapidly approaching the dreaded school age she found her days seemed monotonous, and she wanted more for herself. Her day in and day out routine became just that—a routine. Christina said, “ One day I was folding laundry (that never seemed to end) and I saw a WVJC commercial. At that moment I knew what I needed to do next- “make the call.” She called WVJC and spoke with our Admissions Representative Chasity Duarte. I asked Christina-Why did you choose WVJC and she said “Because of Chasity!” I had always wanted someone to just really talk to me and walk me through the whole process and make me feel comfortable. She guided me through all of my questions and encouraged me to take the chance on myself.” Christina, deciding it was time to do something for herself, and enrolled in school in the Medical Office Administration program. 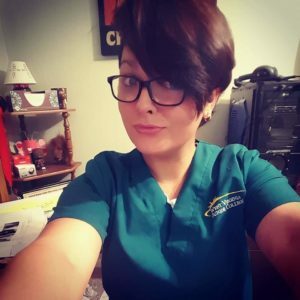 Christina chose the Medical Office field because she knew she wanted to work in a VA hospital, but also knew that she wasn’t cut out for the blood of the Medical Assisting program. Christina’s passion for the military, and the dedication it takes, still runs close to her heart. She wants to give back and do what she can in a Veterans Hospital. Christina also recognizes that moving again is not out of the question for her and her family, so Medical Office Administration jobs are available anywhere life takes her.